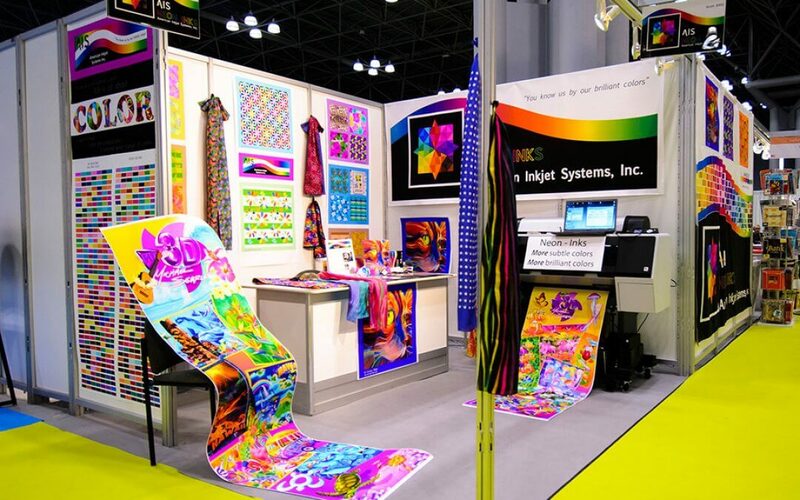 The booth contained textile pre-press prints on matte paper, cotton banners, silk scarves, cotton scarves, and display posters. On the left side wall is a comparison of Epson HDR inks and Neon99 inks having painted a Pantone chart of colors. 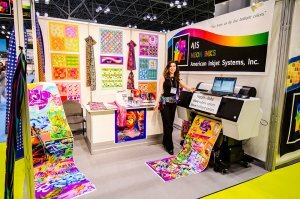 The chart discernibly shows the extensive out-of-gamut colors from Epson’s HDR inks and the cleaner, more brilliant colors produced by AIS Neon99 inks. Neon99 offers brilliant colors: fuscia, hot pink, red, purples, violet, and vibrant blues that other inks can’t reproduce. See it to believe it! The prints were made from designs by Kim Designs, our own design director Lynn Boudreau, and AIS designer Jennifer Topolewski. All printing was done on Epson printers with neon inks.